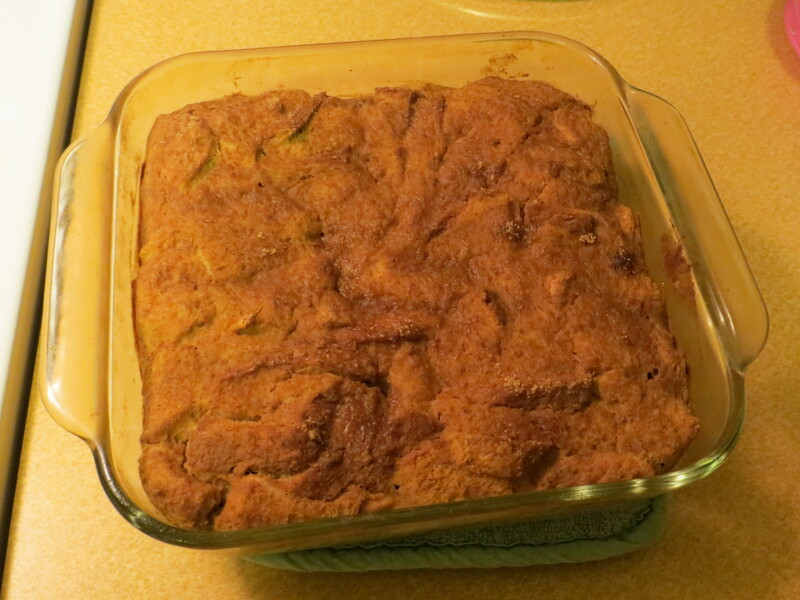 In my last post, I expounded on the joys of bread pudding. 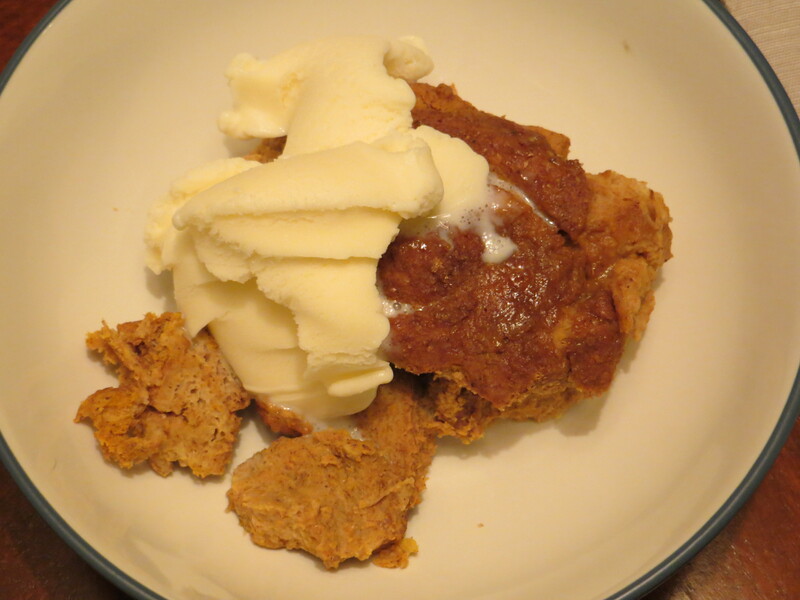 It is no surprise, therefore, that when I received the Hungry Girl’s recent e-mail with a recipe for pumpkin bread pudding, I immediately made plans to try it. Bread pudding AND pumpkin? TWO of my ultimate food pleasures all in one? I had to get to baking. 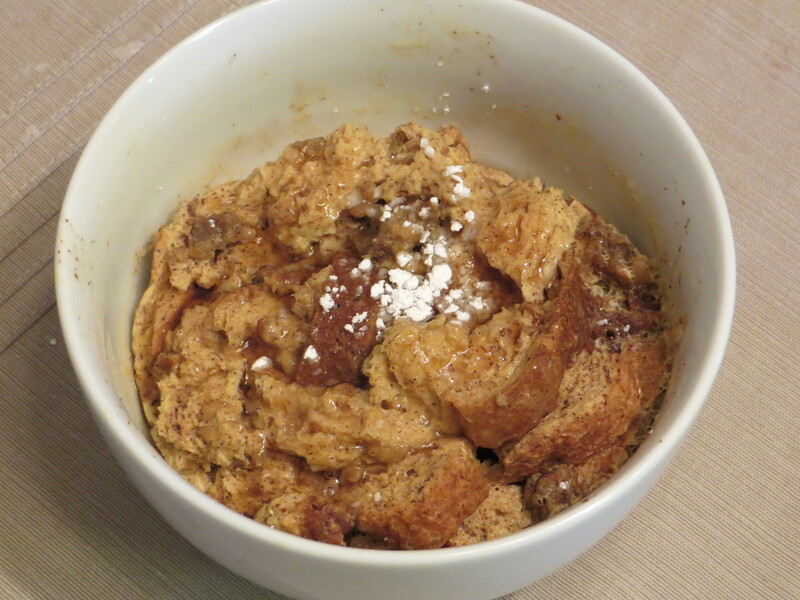 Similarly to the Hungry Girl’s breakfast bread pudding bowl, this dessert recipe is a diet one–light this, fat-free that–but it is also low Points as a result. As the bread pudding baked in the oven, it filled the kitchen with the warm, spicy aroma that I can never get too much of in the fall. I served it warm, topped with light vanilla ice cream. I was especially glad for the ice cream upon discovering that the bread pudding itself was not very sweet. The pumpkin, however, was just right–flavorful but not overpowering. John wondered if the bread pudding would not be a good breakfast recipe, topped with maple syrup rather than ice cream. We never tried it, but I just may next time. As is, the recipe earned 3 stars from John and me. With non-light bread and more sugar, the recipe would definitely earn higher stars. Too bad that means it would have a higher Points value, too! 1. Preheat the oven to 350 degrees. Spray an 8″ X 8″ baking pan with nonstick spray. 2. Lightly toast bread, and cut into bite-sized pieces. 3. In a large microwave-safe bowl, microwave butter for 30 seconds, or until melted. 4. Add bread pieces to the bowl, and toss to coat. 5. In another large bowl, combine remaining ingredients except 2 TB brown sugar, and whisk until uniform. Add mixture to the bowl of buttered bread, and stir to coat. 6. Transfer mixture to the baking pan. Evenly top with remaining 2 TB brown sugar. 7. Bake until firm and set, 40 – 45 minutes. Let cool slightly, about 10 minutes. Yield: 6 servings. Per serving, 5 PointsPlus. The words “bread pudding” are dangerous ones. Not dangerous in the sense of my physical safety. Dangerous in the sense of my waistline. Hearing or seeing bread pudding is all but guaranteed to whittle my willpower into oblivion. My husband has learned that if a restaurant has bread pudding listed on the dessert menu, we are probably going to order it. Bread pudding is my ultimate guilty pleasure. So while perusing The Hungry Girl’s 300 Under 300 cookbook, my eyes–of course–lingered on the title of this breakfast recipe: Sweet and Savory Breakfast Bread Pudding Bowl. Bread pudding for breakfast? Sign me up. Despite my love of bread pudding, my expectations for this recipe were not the highest. After all, the ingredients list screams, “Diet food! Diet food!” Yet I just had to give it a try. I used a MorningStar Farms veggie breakfast patty for the “savory.” The first time I made this, I tried to crumble the patty with the back of a fork, which was mildly successful. Since then, I have cut it up with a fork and knife. The bread pudding bowl tastes much like its name implies – it is both sweet and savory. It does taste a bit like “diet food,” but I still give it 3 stars. I’ve made it multiple times since first trying the recipe out in August. I’ve found that it’s a great way to use up leftover egg substitute from other recipes. Mostly, though, it’s a way for me to enjoy “bread pudding” with none of the guilt. 1. Prepare patty on the stove or microwave according to package instructions. Once cool enough to handle, crumble or chop and set aside. 2. Spray a microwave-safe bowl with nonstick spray. Tear toasted bread into bite-sized pieces and place in the bowl. Add crumbled sausage and set aside. 3. In a small bowl, combine egg substitute, vanilla extract, cinnamon, and 2 TB pancake syrup. Mix well. Pour mixture over the bread pieces and crumbled sausage. If needed, gently stir to ensure bread in thoroughly soaked. 5. Top with remaining 2 TB syrup, powdered sugar, and, if desired, an extra sprinkle of cinnamon. Yield: 1 serving. Per serving, 6 PointsPlus.